The Fiery Furnace! A region so confusing you have to have a permit and guide to enter. A bucket list hike. Hiking on sand. Hate it. We did it! We hit The Mighty 5 in our time in Utah! I know this isn’t an actual accomplishment but…it felt like one to me. Although it was kind of miserable, we managed to get a hike in at Arches National Park. 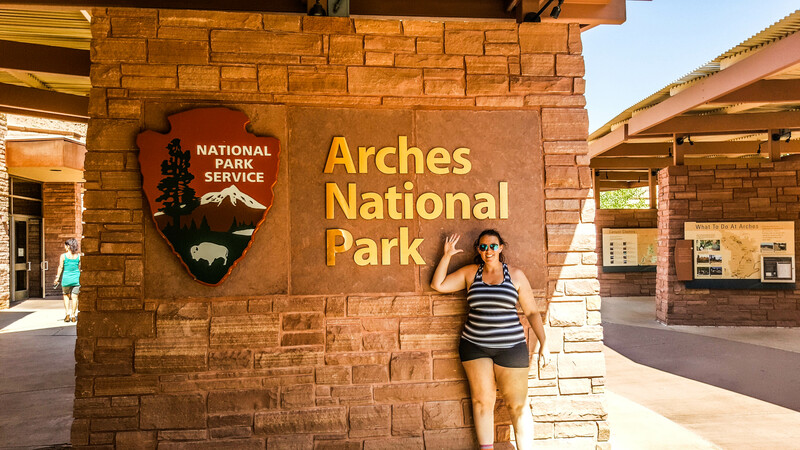 This was Utah park #5 and my 52 Hike Challenge Hike #30 to Landscape Arch. This arch, a natural geologic feature created mostly by various types of water erosion, is the longest arch in North America. It is also the longest span in the park. This long, very thin arch measures around 300 ft wide and is shorter only to four arches in China. Hikers used to be able to walk under Landscape Arch, but as this thin strip of rock continues to erode, slabs are falling from the span. Now hikers can only view the arch from a short distance. The arch was as incredible sight. Unfortunately our pictures just didn’t turn out. The sun was at about the worst position in the sky for photographing this rock, but it was way too hot to hang around and wait for better lighting. Eric and I both thought this park would be really cool to hike at night, so maybe we’ll head back for some night time photography someday. But on this day the arch was an impressive sight that had a humbling effect. It’s hard to comprehend the scale of time and power required to form these arches, especially one on this scale. The force required to move, fold and crack rocks in order to allow water to freeze, thaw and erode in those cracks is massive, and the process of eroding sandstone on a scale this large takes millions of years. Despite my misery, I learned a lot on this hike. Hiking on sand stinks. It just does. I wore as little as publicly acceptable for this hike due to the heat. Some short spandex bike shorts and a tank top. I think this backfired on me when I was feeling the heat from above and below. In the future I think wearing a light, reflective layer would be more effective at keeping me cool. This hike nudged me to pick up an insulated Hydroflask because drinking really hot water on a really hot hike is just awful. When doing a short hike like this where I have access to cold tap water I intend to keep it cold as long as possible from now on. Hiking is convincing me more and more that challenging yourself is a worthwhile pursuit. I was proud of myself for grumpily persevering through this hike, getting a pretty cool payoff at the arch and making it back to the car in one relatively healthy piece. More than the easy, routine, uneventful outings, I reflect on this and my other challenging hikes. This seems to be a bit of a life lesson, too. I can’t wait to get back to Arches as soon as possible, hopefully in cooler weather. It is a weird, amazing place that seems like I could explore forever and never see the same thing twice. Have you hiked at Arches National Park? Tell me about it in the comments!